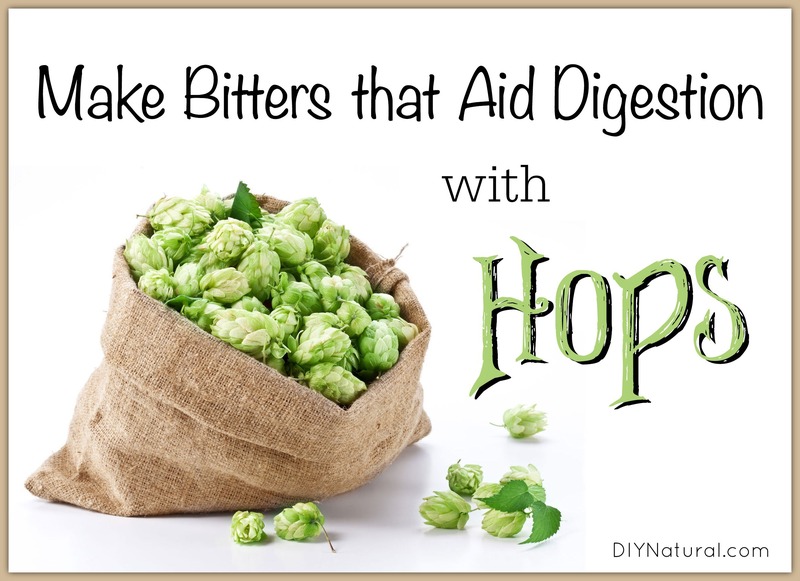 Making bitters from hops is a great idea because the hop vine, often used to brew craft beer, is an excellent sleep aid and also helps digestive ailments. People ask me all the time about my favorite herb. It’s an impossible question. The best I can do is to answer what my favorite is at the moment. I think I can safely say that I’m really enthusiastic about hops (Humulus lupulus) right now. In fact, it’s an herb I’ve written about both in my first book, Conceiving Healthy Babies, and my next book Heal Local. The hop vine needs a cheerleader or two in most circles. Our use of it these days is mainly confined to specialty beers, and that’s a shame. It is incredibly bitter, and bitter, sadly, is not a flavor that we appreciate very much in the American diet. It is the bitter taste of hops that makes it such a digestive system superstar. We have a bitter receptor on our tongue that does not get stimulated by the standard American diet. That bitter receptor is important. Bitter foods signal the liver and the gallbladder to begin their digestive work, pumping bile into the stomach before the food gets there. So much of our diet serves to suppress our digestive juices, so instead of digesting food properly, we have putrefaction. This leads to a host of digestive upsets including gas, bad breath, indigestion, poor nutrient assimilation, intestinal irritation, gallbladder problems, and acid reflux, to name a few. Here at our farm, we make a bitters formula with hops and it is one of my favorites! Just 15-30 drops of any bitters formula 15 minutes before you eat can get digestion working properly and literally change your life. Add the herbs in your formula to a quart jar. Your herbs should not fill more than half the jar. Cover with either vodka or warm apple cider vinegar to the top of the jar. Cover with a tightly fitting lid and shake. Keep your bitters formula somewhere you will see it to remind you to shake often. Allow it to steep like this for 4-6 weeks. Strain and store in amber glass bottles (like those found here). NOTE: Take care to look up any contraindications that apply to your family as you will be using this every day. Take 15-30 drops of bitters 15 minutes before meals. Note: you should also check out our other article on how to make bitters. Hops are easy to grow and very beautiful in the landscape. In the summer when the blooms (called strobules) are opening up and still green, harvest and dry them for later use. We love our vines and collect all the hops our family needs each year off a couple plants. Have you ever used hops for better health? If so, share with us in the comments section! opinion believe it from numerous varied angles. Its like men and women aren’t involved except it is something to do with Girl gaga! Can this be used when nursing?